The three and a half months public consultation period - on the Department for Transport plans for the Olympic Road Network (ORN) - ended on 19 March 2009, before Council officers had even got around to having a meeting to discuss it, never mind actually respond on behalf of the thousands of Greenwich Council Tax payers and road users who will be affected by the proposals. Greenwich councillors finally got their act together and met to talk about the proposed Designation of the Olympic Road Network, er, five days after the deadline expired. The News Shopper reports that The Council has hit back at the accusations, saying it did manage to get its response in on time and had held it back until the last minute to "reflect the most up to date situation". Their response was presented to Cabinet on 24 March. For six weeks or so, disruption to life in Greenwich - due to around 44 roads being closed or to special traffic regulations (including designated "Games Lanes") - is expected to be massive. 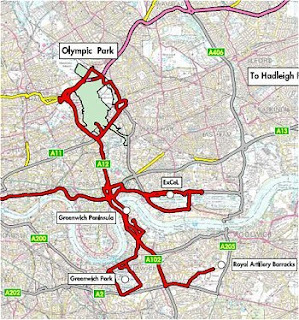 Parts of the A2 (eg Shooters Hill Road and Blackheath Hill) will come within the Olympic road network; and roads around Greenwich Park, where the equestrian events are to be held, will be at the very centre of the network and heavily used by Olympic traffic. Ordinary road users who stray onto the ORN face heavy fines (£5,000 per offence has been suggested). Shops and restaurants whose loading bays are in the way of the ORN will find the loading bays swept away and will have to porter their supplies from other streets. See for instance, Olympic express routes will cause chaos, for more about the proposed clampdown and its effects. "Carry ID, or you won’t get home"